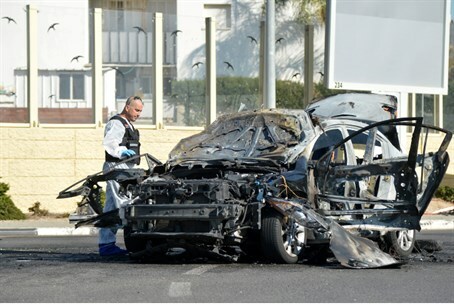 Sinai terror group founder, responsible for 2011 killing of eight Israelis, dies as car-crash detonates bomb on-board. A Sinai-based terrorist group has acknowledged that one of its founders, who took part in the 2011 coordinated attack on Eilat that killed eight Israelis, died last Tuesday. The terrorist was involved in a car crash, which detonated the explosives he was transporting. The terrorist, identified as Tuwafik Mohammed Frij or "Abu Abdallah," was a leader of the Salafist Ansar Bayt al-Maqdis terror organization that has claimed responsibility for firing Grad rockets at Eilat. Specifics about the car crash have not been released, although as noted, it has been announced the terrorist's death was caused after the bomb he was transporting exploded due to a traffic accident. Frij was the commander responsible for the 2011 coordinated Eilat attack, in which three terrorists opened fire on bus # 392 from Be'er Sheva to Eilat as it neared its destination, injuring seven. Soldiers on board fired back, killing at least two of the three operatives and leaving a third critically injured. Terrorists targeted a second Egged bus less than an hour later near Eilat, killing the driver, and then opening fire on other Israeli-driven cars killing five more. An IDF military vehicle was blown up by an explosive planted on the narrow road as it raced to the scene, killing the soldiers inside. Frij's death brings to mind another terrorist "work accident" last Saturday, when a Gaza terrorist died and nine more were wounded in an explosion. "The explosion occurred during a training session in bomb-making," said a statement from the Ezzedine al-Qassam Brigades, the military wing of Hamas. Source identified the dead terrorist as Ibrahim al-Ghoul, a local Hamas commander. Sinai has turned even more into a lawless hotbed of terror since the "Arab Spring." In particular, gas pipelines in the area have been attacked more than a dozen times since the revolution that toppled former President Hosni Mubarak in 2011.